Continuous positive airway pressure (CPAP) is a form of positive airway pressure ventilator, which applies mild air pressure on a continuous basis to keep the airways continuously open in people who are not able to breathe spontaneously on their own. It is an alternative to positive end-expiratory pressure (PEEP). Both modalities stent the lungs' alveoli open and thus recruit more of the lung's surface area for ventilation, but, while PEEP refers to devices that impose positive pressure only at the end of the exhalation, CPAP devices apply continuous positive airway pressure throughout the breathing cycle. 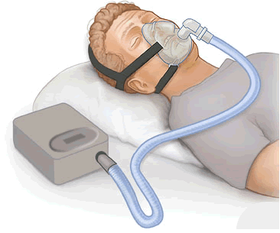 Thus, the ventilator itself does not cycle during CPAP, no additional pressure above the level of CPAP is provided, and patients must initiate all of their breaths. CPAP typically is used for people who have breathing problems, such as sleep apnea. CPAP also may be used to treat preterm infants whose lungs have not yet fully developed. For example, physicians may use CPAP in infants with respiratory distress syndrome. It is associated with a decrease in the incidence of bronchopulmonary dysplasia. In some preterm infants whose lungs have not fully developed, CPAP improves survival and decreases the need for steroid treatment for their lungs. In resource-limited settings where CPAP improves respiratory rate and survival in children with primary pulmonary disease, researchers have found that nurses can initiate and manage care with once or twice daily physician rounds. CPAP therapy utilizes machines specifically designed to deliver a constant flow of pressure. Some CPAP machines have other features as well, such as heated humidifiers. CPAP is the most effective treatment for obstructive sleep apnea, in which the mild pressure from the CPAP prevents the airway from collapsing or becoming blocked. Although delivery of CPAP through a nasal mask is the most common modality of treatment, other systems exist for interfacing with adults and children. Nasal CPAP is frequently used in infants, though its use is controversial. Studies have shown nasal CPAP reduces ventilator time but an increased occurrence of pneumothorax was also prevalent. Oral masks and naso-oral masks are often used when nasal congestion or obstruction is an issue. Devices that combine nasal pressure with maxillary advancement devices (MAD) also exist. Swallowing of air into the stomach may occur. This is the pressure applied without pause or end to the airway. Generally utilizing flow to generate the pressure. Positive end-expiratory pressure (PEEP) is the pressure in the lungs (alveolar pressure) above atmospheric pressure (the pressure outside of the body) that exists at the end of expiration. This feature is present on many devices and allows the user to reduce the pressure to lowest setting and gradually increase to the set pressure. This allows the user to fall asleep with the pressure at a more comfortable setting. Fractional O2 percentage — that is, the fraction of inspired oxygen that is added to the delivered air. ^ Werman, Howard A.; Karren, K; Mistovich, Joseph (2014). "Continuous Positive Airway Pressure(CPAP)". In Werman A. Howard; Mistovich J; Karren K (eds.). Prehospital Emergency Care, 10e. Pearson Education, Inc.
^ Patrick, Wilson; Moresky, Rachel; Baiden, Frank; Brooks, Joshua; Morris, Marilyn; Giessler, Katie; Punguyire, Damien; Apio, Gavin; Agyeman-Ampromfi, Akua; Lopez-Pintado, Sara; Sylverken, Justice; Nyarko-Jectey, Kwadwo; Tagbor, Harry (June 2017). "Continuous positive airway pressure for children with undifferentiated respiratory distress in Ghana: an open-label, cluster, crossover trial". Lancet Global Health. 5: e615. ^ Werman, Howard A.; Karren, K; Mistovich, Joseph (2014). "Continuous Positive Airway Pressure(CPAP)". In Werman A. Howard; Mistovich J; Karren K (eds.). Prehospital Emergency Care, 10e. Pearson Education, Inc. p. 242. ^ Morley, C. J.; Davis, P. G.; Doyle, L. W.; Brion, L. P.; Hascoet, J. M.; Carlin, J. B.; Coin Trial, I. (2008). "Nasal CPAP or Intubation at Birth for Very Preterm Infants". New England Journal of Medicine. 358 (7): 700–708. doi:10.1056/NEJMoa072788. PMID 18272893.